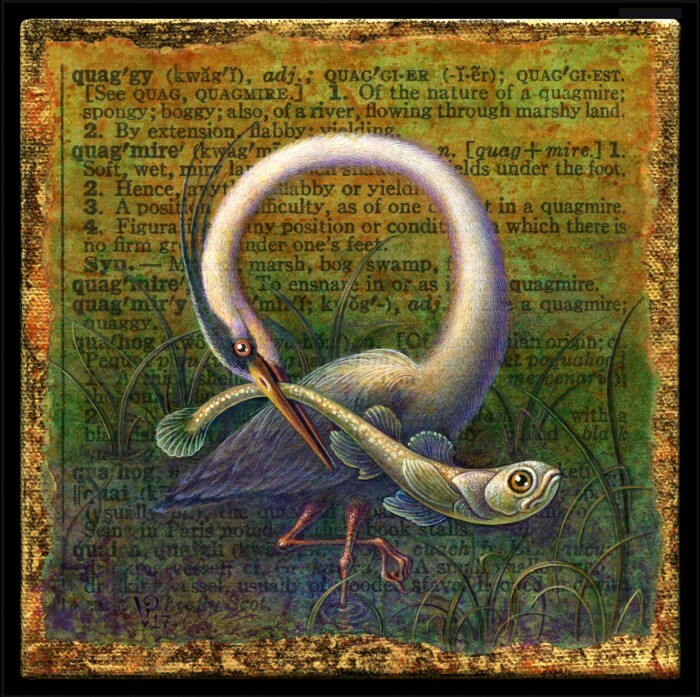 Quaggy Ecology | Leah Palmer Preiss ~ Curious Art: Acrylic on text on canvas, 6" x 6"
Quaggy Ecology Acrylic on text on canvas, 6" x 6"
My parents live by a pond (with very quaggy edges) & for a while they were regularly visited by a magnificent great blue heron. So when Anu gave me this word, I instantly thought of “Oscar” (as he was named by my grandmother, though I’m not sure why). 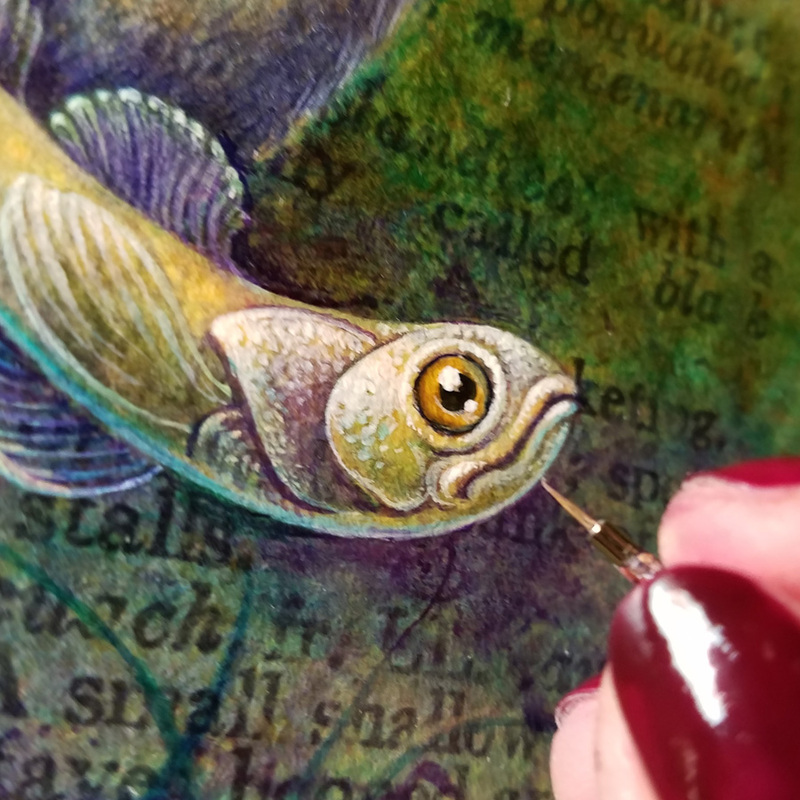 I doubt Oscar ever landed a fish as large as this, nor could his neck bend in quite such a conveniently Q-like fashion, but he was an intrepid fisherman & a gorgeous creature, so this is my tribute to his majestic beauty. North Carolina (where most of my family lives) is the home of wonderful wetlands. As with many such areas across the country, they are very much in danger from over-development, so I thought of this dilemma often as I was painting this. Let’s hope generations to come will still be able to experience the wonder & awe I felt when Oscar came to visit. 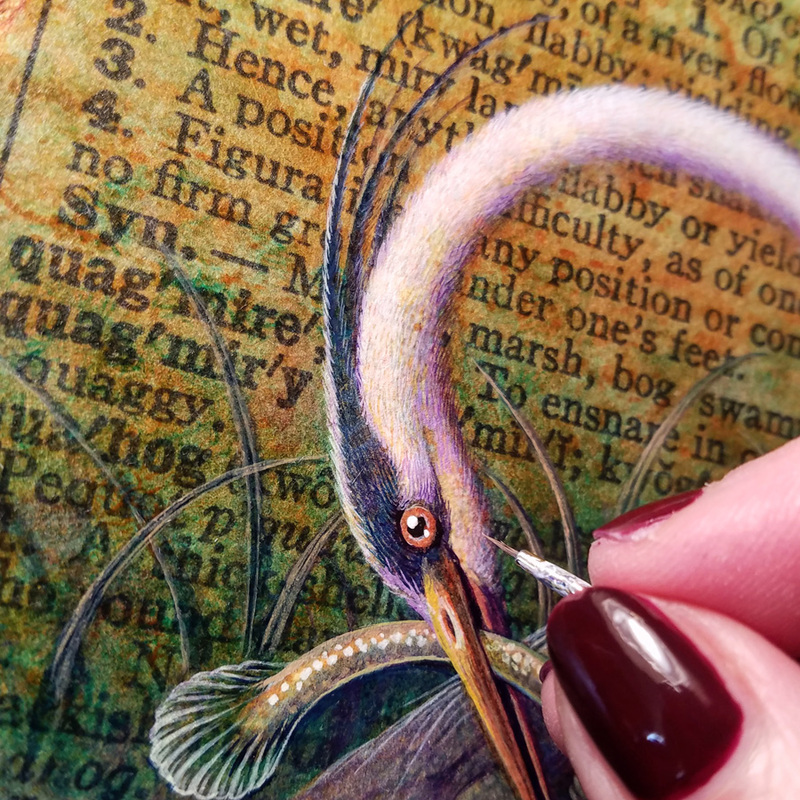 This entry was posted in A Word A Day Illustrations, Art, Paintings, Prints Available, Uncategorized and tagged A Word A Day, Acrylic, AWAD 2017, Birds, Collage, Curiotype, Ecology, Great Blue Heron, Leah Palmer Preiss, Marsh, Painting, Quaggy, Swamp, Wetlands on 6December 2017 by Leah. I am curious as to whether you are related to the illustrator, Robin Preiss Glasser. I have been reading “Fancy Nancy” books with some fans of that series–first graders in Syracuse, NY. I see that the pictures are “based on the art of Robin Preiss Glasser. The middle name is not that common! Not that I know of, Nancy, but I actually have niece named Robin Preiss! It is a fairly unusual name… I always have to correct spelling or pronunciation (it’s pronounced “price”). Marvelous rendition! Like you, we here in Tidewater Virginia are standing vigil over the demise of the quaggy delights of old. Our home is in a suburban development in York County next to the Williamsburg/Newport News airport; it was a swamp until “developed” 25 years ago. We still have greenspace, retention ponds and lakes here which offer us the persistent presence of blue heron, osprey, and migratory fowl….but precious little that’s truly quaggy. We take what we can get and try to keep it intact. Thanks for memorializing the blessings of the quagmires, past and present. Sadly, it’s the case almost everywhere these days. But I’m glad you are still enjoying the wildlife. Aww, thanks, Bill! I’m glad you get to see these magnificent creatures so often!